This coming season will be Don Zimmer's 64th in professional baseball. 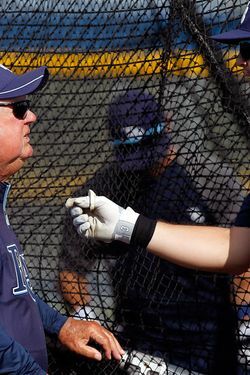 And Zimmer — now in his ninth season as a senior baseball adviser with the Rays — has several connections to New York: He played in four seasons with the Brooklyn Dodgers (including their championship 1955 season), spent eight years as Joe Torre's bench coach with the Yankees, and, 50 years ago this spring, he started at third base for the Mets on Opening Day, 1962, appearing in fourteen games during the franchise's inaugural season before getting traded to Cincinnati. Zimmer spoke with The Sports Section about the early days of the Mets, what Yankees fans should know about the Rays, and the infamous incident with Pedro Martinez during the 2003 ALCS. What do you remember about your time with the Mets back in 1962? Well, first of all, I can remember because I lived in St. Pete, they sent the uniforms down a little bit before time, before spring training, and they wanted me to come down and put on this Met uniform. So I had my son with me, and that’s the picture we have at home, with him on my shoulders. And we took the first picture. One thing I can say about the Mets: The guy who decided to get Casey Stengel as the manager — it was a brilliant move. Because we went into spring training, and you would have thought we’d won four World Series going into spring training. Media all over the world, all over the country, mainly because of Casey Stengel. And that’s what I remember. Did you have any idea during spring training, or in the early weeks of the season, that the team would lose as many games as it did? Well — I kid guys — I tell them, “Don’t blame me for all of ‘em. I got traded early in the season.” But I didn’t contribute too much. I think I hit .170 or something. [Ed. Note: It was actually .077.] And you know, guys kid me today about being on the worst team in the world; I say, "Don’t blame all the losses on me, because I got traded very early in the season." What should Yankees fans know about the Rays that they might not know? Yankees fans know that the Rays are in the league ‘cause we play like heck against them. We play like heck against them and Boston for sure. And when you got the kind of pitching we have, you feel like you can win every game because you think the pitcher’s going to throw a good game every time. It doesn’t happen all the time, but that’s where you start. We don’t knock fences down and this and that, but we play defense and pitch, and that’s the reason we had success. Have you spoken to Pedro Martinez since the incident in the 2003 ALCS? Do you ever think you would? No, no. A lot of people took that the wrong way. They said that Martinez threw me down, [that] it was a terrible thing. He didn’t do nothing wrong. I’m the one who went after him, and he just threw me down. What’s he going to do? Let me do what I wanted to do? And he just threw me down, and I couldn’t get up. My legs wouldn’t let me get up. I did wrong by leaving the bench. I was the only guy sitting on the bench when the melee started, and I said, "I can’t be the only one sitting on the bench." And I said, "There’s only one guy I’m looking for, [and it] is Pedro." And he wasn’t in the pile. So I come up out of the bench, walking out of the bench, and that’s when I went after him, and unfortunately I didn’t get to him. If you had gotten to him, what would have happened? Well, there was many things, many reasons. People don’t understand. I’ve seen this guy throw at so many guys’ heads that ... He was a great pitcher, but he threw at so many heads that ... He did a lot of things that were unprofessional, I thought. And it was building up to me. And I just sat there and watched it all. Then things happened, and that’s when he threw at Karim Garcia. Threw it right at his head, then pointed over at Posada, who was on deck — “You’re next.” That’s the way he was. There’s no question he was one of the greatest pitchers of our time, but the reason I went after him was I didn’t like the way he did things. Do you have a favorite moment from your career? Yes. When I was managing the Red Sox, we were supposed to win, and we wound up second all the time. I went to the Cubs, and Jim Frey was the general manager. And I went to the Cubs, and we went to Arizona, and I think we were 5-28 in spring training [in 1989]. It was terrible. And Jim Frey said to me, "You think we can win 81 games and lose 81 games?" I said, "Jimmy, if we win 81 games, then you and I will dance down Michigan Avenue together." I had five rookies in the lineup. Guys kept saying, "Well, you can’t win with five rookies and a rookie catcher." And I said "What do you want me to do, get an old-man catcher that can’t do nothing? Or do you want to have a young catcher that could do some things?" And that was Joe Girardi. And the season was half over, we’re like two games out of first. I said, "Why can’t we can’t we be as good as them." This team played so great, it was unbelievable. When we clinched [the division, in Montreal], that’s the happiest moment of my life. It’s a team that everybody picked last. Every sportswriter in the country picked us last. And I would have picked us last, too. But the players, they just played their hearts out. And when we won, that’s the happiest time of my life. And that was my biggest thrill. Do you have a toughest loss? Yeah. Yeah, yeah, yeah. We win 99 games and tied for pennant, and the Yankees beat us in the one game playoff. You must have run into Bucky Dent while you were with the Yankees. Was that ever hard? No. In baseball, things like that happen, and you move on. That’s all. It was a tough loss. Real tough. I had players when the game was over that was actually crying. And I was probably crying with them. But that’s over. That’s what happens if you want to be in this game.